Firstly, I trust everyone had a thoroughly satiating Thanksgiving. And secondly…hoot! It’s Black Friday! And you know what that means…SALES! And leftovers. 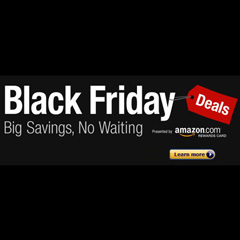 Amazon’s landing page for their hottest Black Friday Weekend specials. Grab a deal in virtually any category. Ends one week from Monday 28. Taylor Gifts and Get Organized are promoting a Black Friday TRIPLE sale, where you get 20% off everything + $4.95 shipping + a free gift on purchases over $40 (automatically applied through the links above). A bunch of awesome deals including the Star Trek Pizza Cutter [$19.99] and the iCade [$59.99]. One day only though, so you gotta be quick! That’s right. 10% off everything at Smarthome when you use voucher code ESHBF1110 at the checkout. Furthermore, they’re offering 20% off Smarthome brand Insteon products with voucher code ESHBF1120. Both offers end November 28. Up to 50% Off at B&N! There are big discounts to be had across all their verticals, including offers on the NOOK reader. And that’s a wrap! Mmm…turkey and stuffing and pita bread oh my (you taste good). « Captain Jack Harkness Coat: Winter Is When Everything Changes. And You’ve Got To Be Ready!